It’s an historic day today. Lots of people were planning a party/wake. Big ones. But things have got derailed. No-one can agree on what to celebrate/mourn – or even when to celebrate/mourn it. There’s a serious danger no-one gets a party at all tonight. But don’t worry – TOTC is here to turn things around and get the party started. The key is choosing something non-Brexit related to celebrate. So we’ve talked everyone around, got all the main political parties on board, and have some fun party games charts lined-up. So tonight join in by raising a glass, or a bottle of gin, and celebrating the National Minimum Wage’s 20th birthday with our long read special. On 1 April 1999 the National Minimum Wage (NMW) was born – a £3.60 wage floor for everyone aged 23 and over. The country giving birth to this policy was an anxious parent – it was introduced amid widespread business opposition, a divided House of Commons, and warnings of a million or more jobs losses. The policy has come a long way over the past 20 years, as has Britain. So what has the ageing process taught us? As for all of us, the NMW’s ageing processes has involved distinct phases. Cautious increases following its introduction were followed by a five-year ramping up from 2003 until the financial crisis, with repeated rises well above typical earnings growth. 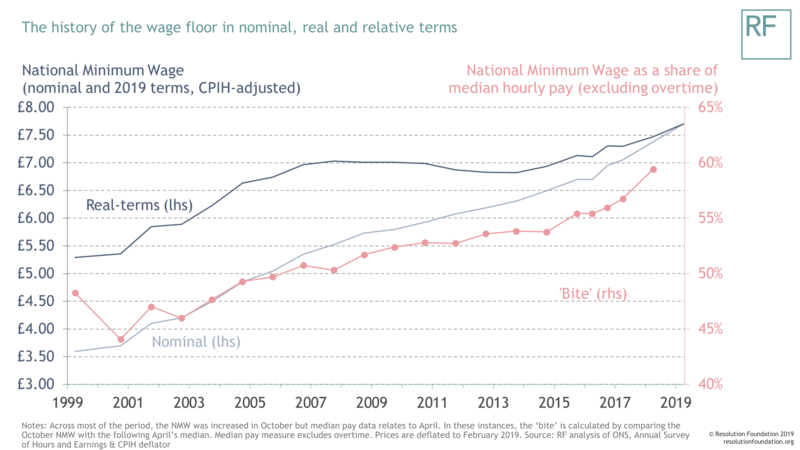 We can think about the ambition of minimum wage rates by comparing the legal minimum to what a typical worker earns – what we call the NMW’s ‘bite’. What had begun as a fairly modest minimum wage with a bite of around 45 per cent exceeded 50 per cent by the time Northern Rock kicked off the financial crisis in Britain. A third phase of a flat or falling NMW in real terms followed through the financial crisis. The only good news for minimum wage workers was that their wage falls were smaller than those of other workers, meaning that the bite continued to crawl up. That crawl became a sprint following George Osborne’s announcement of a higher wage floor for workers aged 25+ in 2015 – the new National Living Wage (NLW), which is of course different to the voluntary real ‘Living Wage’. The NLW’s target bite was 60 per cent vs the typical 25+ worker in 2020. To get there we have seen the wage floor rise twice as fast as typical earnings – and it will hit £8.21 on Monday. The increase in ambition of the UK minimum wage over these 20 years is staggering. Internationally the UK has moved from the back of the pack towards being a world leader. 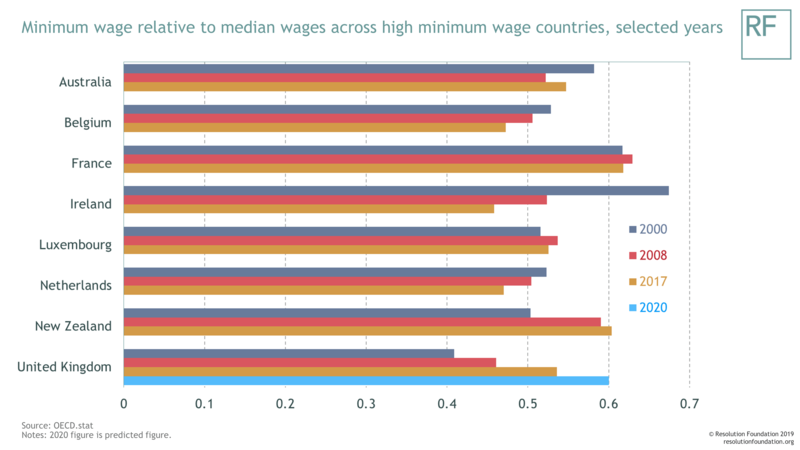 By 2020, only New Zealand and France will have similarly ambitious wage floors. No major economy has seen the ramping up post-crisis we put in place. The purpose of the NMW was to have a positive effect on the wages of the low paid. This it has done in spades. Over the past two decades, the bottom fifth of workers have seen real pay growth of 40 per cent – twice as fast as the rest of the workforce. As a result in 2017 the proportion of employees that are ‘low paid’ (earning less than two-thirds of typical the national median) fell to its lowest level since 1982. 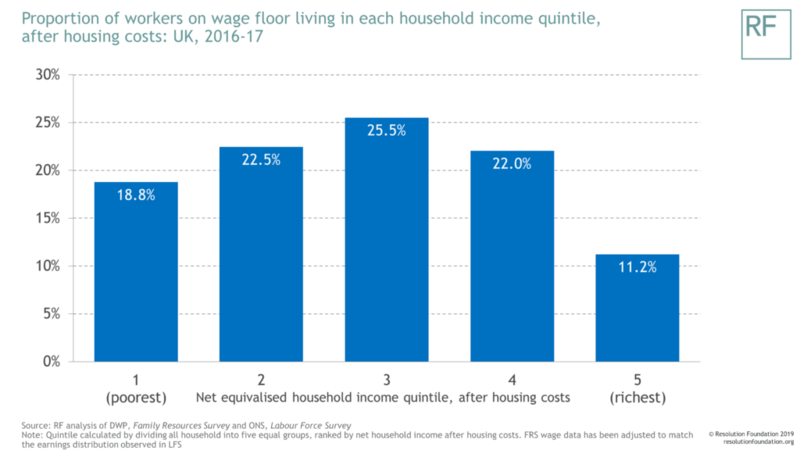 It isn’t just the very lowest paid who have benefitted either, with strong evidence of spillovers as wages just above the wage floor are also pushed up as firms seek to maintain wage differentials. Much faster pay rises at the bottom are a big deal for inequality. The minimum wage has brought to a half the previous 20 year rise in earnings inequality, reducing hourly earnings inequality significantly. But that has not been enough to make significant dents in weekly earnings or income inequalities – which is what we ultimately care about from a living standards perspective. Understanding why that is the case is crucial in recognising the roles and limitations of minimum wages.The first lesson is that while how much we get paid an hour matters a lot, so too does how many hours a week we work. 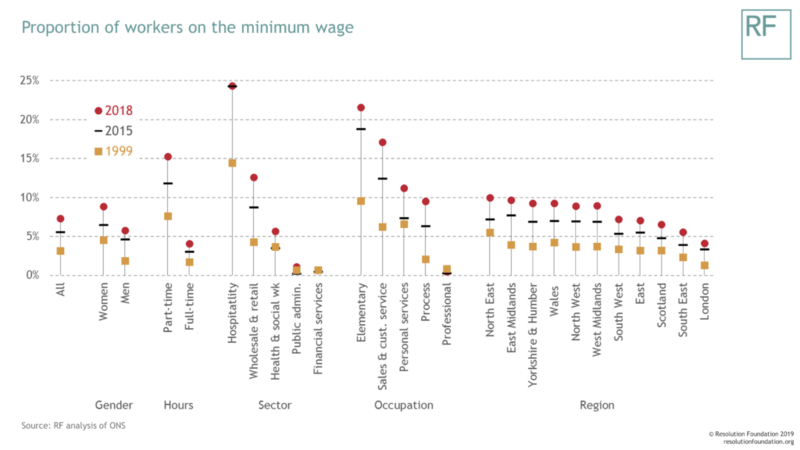 Reductions in hours worked, particularly amongst lower earning men, have countered the inequality reducing impact of the NMW. 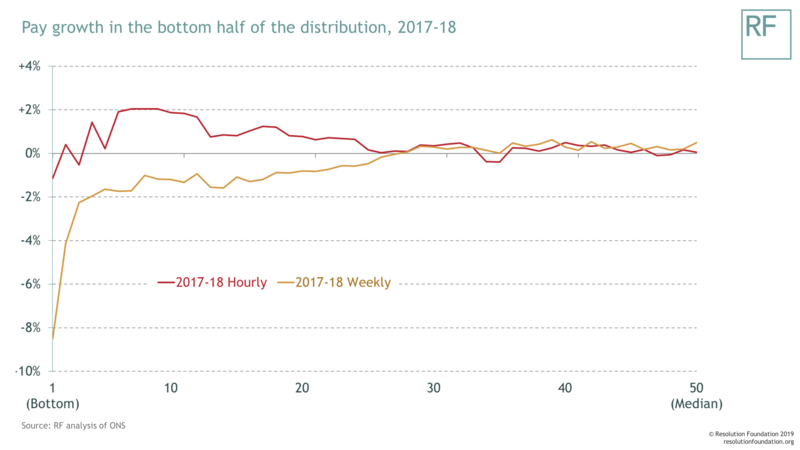 The crucial role of hours worked can be seen by looking at hourly and weekly pay growth for the bottom half of the pay distribution in the chart below. While hourly pay growth is strongest for the lowest earners, weekly pay actually fell for the bottom 30 per cent. Now some people may have chosen to work fewer hours, but we also know lower earners often can’t get the hours they want with the security they need. This issue needs to stay in focus, even as we celebrate the NMW’s anniversary. The second lesson is that the middle class, not just the poor, should be grateful for the NMW. Because many of us live in households with more than one earner, it is wrong to assume that the lowest earners live in the poorest households. Indeed more than one-in-three workers on the wage floor lives in the top half of the household income distribution. This is the fundamental reason why we should reject the arguments made (on the right and the left) that we need to choose a favourite child between minimum wages and in-work support like tax credits or Universal Credit. Both are important, with the latter allowing targeting on the basis of household incomes, and so taking into account overall household earnings and costs pressures like children or housing. Cuts to such support are what risks driving up child poverty in the years ahead – despite ongoing increases to the NLW. While Monday marks a major anniversary for the UK’s wage floor, its journey will continue afterwards. Another year of big increases is planned for April 2020 as the NLW approaches its target level, and the debate about how much higher it can go is already underway. 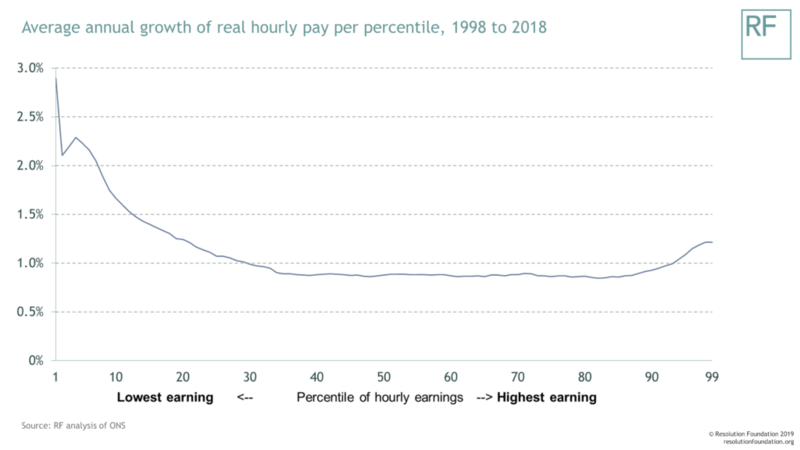 The Chancellor wants to see further increases into the 2020s with “the ultimate objective of ending low pay in the UK”, meaning further big rises to a 66 per cent bite. Meanwhile Labour is calling for a £10 minimum wage in 2020. It’s hard to compare these ambitions exactly, but either would take the UK above the minimum wages of any other major advanced economy – including France.Now it’s good to be ambitious. But there will be a point at which real employment effects are felt, and none of us wants to set our kids up to fail. That doesn’t mean not pushing further. But it does mean such increases should be evidence-based, and something you are prepared to reverse if adverse effects do start to materialise. That’s why it’s welcome that the Chancellor has appointed Arindrajit Dube, a US economist with a track record of following the evidence on minimum wages, to lead a review on the issue, while the LPC’s ongoing role is also critical. Our focus needs to go beyond the employment impacts to the wider effects on our labour market as our wage floor ambition continues to grow. In particular there are some parts of our country and economy for whom the wage floor is something nearer a going rate rather than an absolute minimum – posing real challenges for incentives for workers to progress. Today a quarter of hospitality workers are on the wage floor, while in the North East 10 per cent of all workers are. Further increases into the 2020s are likely to see the number of minimum wage workers exceed 3 million, and we would likely see more workers having their wages set by the state’s minimums than are covered by all collective agreements negotiated between unions and employers in the private sector put together. What exactly these huge shifts in our labour market would mean is something no-one knows for sure. There aren’t many policies that are hugely controversial at birth but which go on to become widely recognised triumphs. The National Minimum Wage is one shining example. And on the day when the UK was meant to be Brexiting, but instead has no idea where it’s heading, it’s very much worth celebrating our now very grown up wage floor. Not only has it provided much needed pay rises for our lowest paid workers, but it offers proof that politics and policy can and does make a difference.